Having said all that, there is some interesting material in the book. McFarland challenges the great biologist and science communicator Steven J. Gould, who suggested that if you rewound the 'tape of life' and played it again, things would have turned out to be very different. According to McFarland, everything is so limited by chemistry, that the new history of life would seem extremely familiar. That's fair enough, though I think McFarland exaggerates Gould's point to be able to challenge it, which he does repeatedly. I don't think Gould was really suggesting that another run of the development of life would produced silicon-based lifeforms using arsenic where we would use phosphorus. Rather, Gould was suggesting that within a very basic related framework, many of the outcomes were dictated by chance in a hugely complex (and indeed chaotic) system, meaning that the results would be likely to be significantly different to lifeforms we see today. However, if you overlook McFarland's obsession with proving Gould wrong, his exploration of how very few elements could play the part they do in living creatures is genuinely absorbing, especially where he demonstrates the importance of size, charge and bond strengths as determiners of the possible outcomes. Much of the book focuses on how life might have developed, seen from his unique chemist's viewpoint. This isn't the best book to get a feel for the nature of biological life and the complexity that is involved - a far better read on that subject is Nick Lane's The Vital Question. 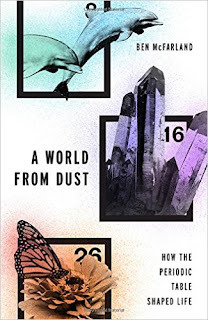 Yet it's impossible to deny that McFarland's unique way of looking at things gives new insights to the reader on the topic established in the subtitle: how the periodic table shaped life. I personally found the approach and style irritating (and struggled with most of the fuzzy illustrations). But the book may well work for other readers, especially if they have a chemistry background. And this is a a true, brave attempt to be different in approach to popular science writing, which must be applauded.